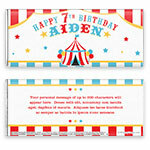 Fun and whimsical, with retro style, this circus-inspired wrapper will bring a special touch to your next party. Design: Fun circus tent with balloons and stars. Personalization: Front message, back message.